I’ve been pretty slack on the baking front lately, largely because I’ve been pretty flat out on the work front. I haven’t even wanted to bake, which is unlike me. Luckily inspiration arrived in the form of a new cookbook : For Food’s Sake, a Thermomix book. I still feel like I’m learning to drive the Thermomix, and I’m sure I don’t make full use of it, but it certainly makes cakes easy! Having recently made healthy (as long as you accept dried fruit as healthy) “brownies”, I decided to make blatantly unhealthy ones. 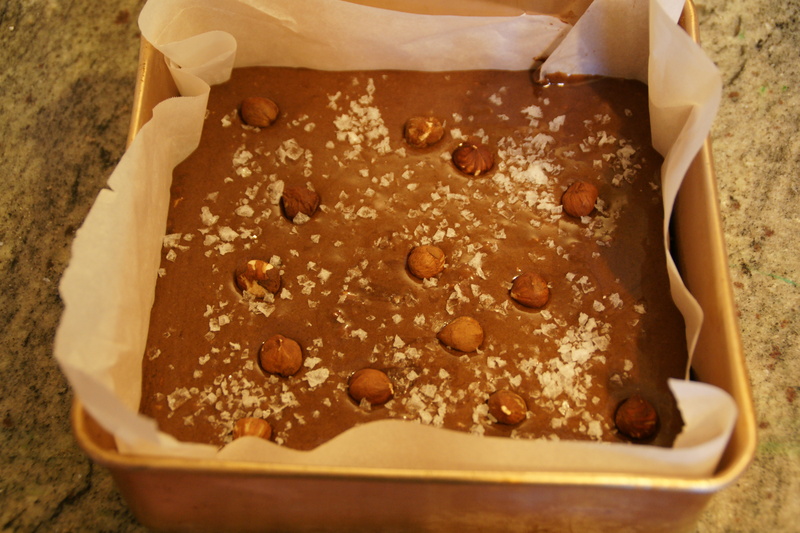 Tenina’s recipe for her salted caramel brownies can be found here, so I feel ok about reproducing the recipe. The original recipe uses macadamias and pecans, but I didn’t have those. 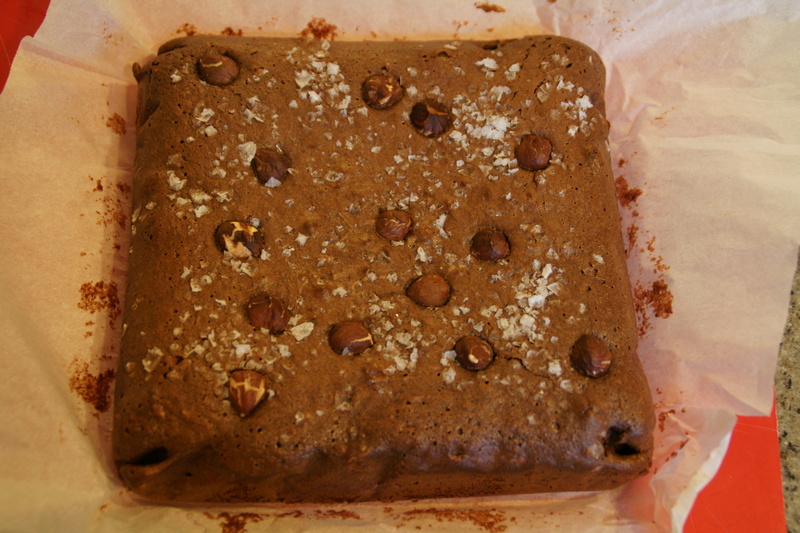 Preheat oven to 180 degrees and line a 22cm square cake tin with baking paper. Put sugar, butter and vanilla into the Thermomix and chop 5 seconds on speed 6. Cook for 15 mins at varoma temp, speed 2. Add salt and mix for 10 seconds on speed 4. Add eggs, yolk, cocoa to bowl and mix for 15 seconds on speed 5. Scrape down bowl, add flour and nuts and mix for 15 seconds on speed 5. Spread into tin, stud with extra nuts and sprinkle with sea salt. Bake for 10 mins then take it out, bang it on the bench and bake for another 10 minutes. Let it cool in the tin for a bit before slicing. It was a really easy Thermomix recipe and I imagine would be fairly easy if made conventionally using a saucepan and food processor. 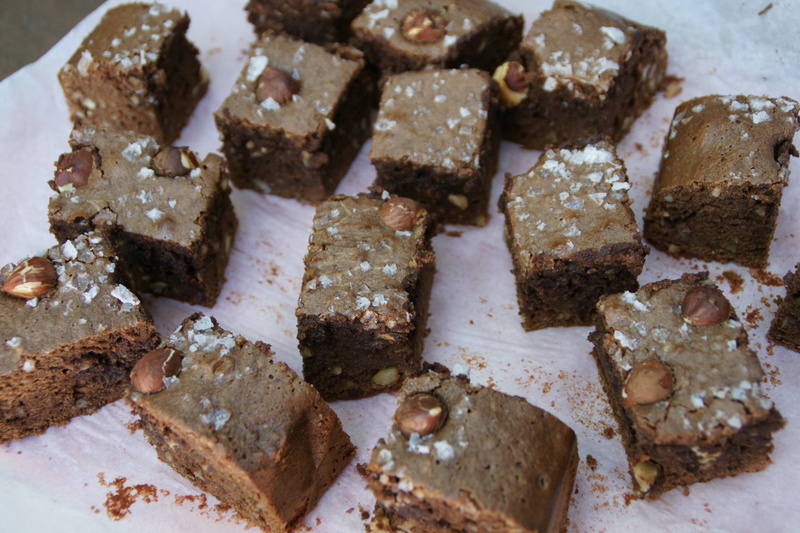 I over baked mine so the edge pieces were more like cake than brownie, but still tasty. The salt was a winner. So a year or more down the track are you happy with your investment and would you recommend it? yes and yes, with reservations. Firstly, I am not a fan of the “official” cook books – I found I kept making bland mush. However, there are a number of great sites with interesting recipes, you just have to search for them. Secondly, I had fantasies of the Thermomix completely changing my “family” cooking, which hasn’t happened. This is largely because my childrens’ preference is for distinct elements, ie chicken strips/crumbed fish/sausages + veg + starch. This is not my preference but I couldn’t be bothered making multiple meals, so I generally go with what I know to be a healthy option which will get eaten. I am confident this will change as they get older though. I was also a bit disappointed to find that the Thermomix spag bol (the childrens’ favourite) is not great. For some reason it always ends up watery and bitter. Overall though I think it is great. I just need to make better use of it. Oh I have been on the lookout for a Thermomix. Im unsue if I want to commit though 😦 love the brownies! YUM!